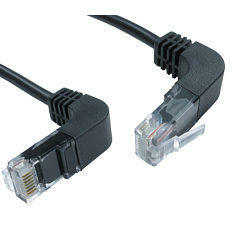 0.5m angle ethernet cable, the angled CAT5e cable is ideal for situations where space is limited or angled connectors are prefered. The position of the cable from the angle will either be going up or going down depending on the position of the port it is going in. If the position of the latch on the cable is pointing down, the cable will point upwards. If the position of the latch on the cable is pointing upwards, the cable will point downwards. Ideal for connecting wall mounted smart TVs where space is limited.